There have been few showers but several dark days so far this month. I think of April as renewal time. The first greening of the outdoors, the peeper toads singing in the evening. Firsts are counted in things longed for all winter; first day over 70°, first night with the heat off and the windows open, first meal cooked outside and served al fresco on the deck. Sight, sound, smell, and touch have all become heightened so it was crippling to lose my dear old camera. It had been showing signs of age; A Nikon D50 it was the first digital camera I have owned. I shot film previously and fought the switch until the quality seemed hard to argue with. The D50 model offered at whopping 6.1 megapixels when I bought it. Today, camera’s on the most basic phone have more pixels. I pat myself on the back for getting shots as good as I have on this gem, though some of my all-time favorites were shot long ago on Kodachrome. I can not justify buying a camera at this point in my financial life. Like music, however, I can’t live without it. What wonders of technology this month has brought! A blue-tooth, wireless speaker that replaced an entire 6 speaker “stereo system” and a camera with 24.1 mega pixels. This entry was posted in memoir. 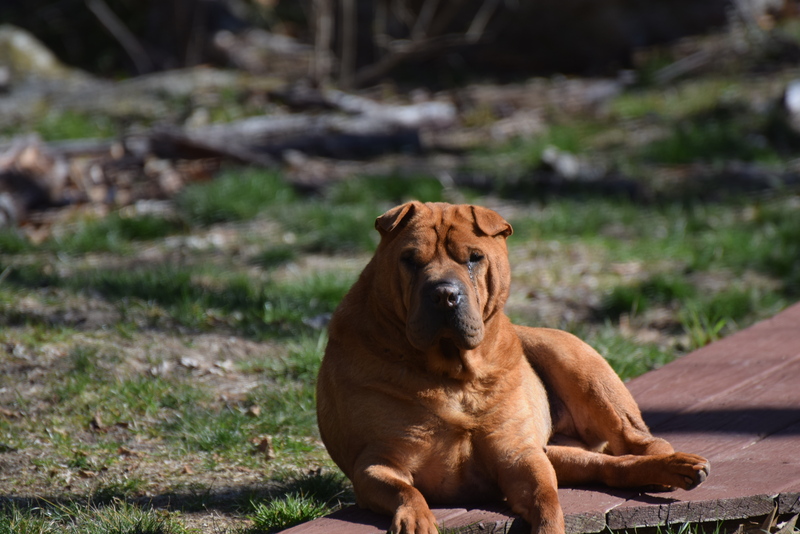 Tagged aging, April in NH, blogging, life after 60, memoir, recreating oneself, Shar Pei, unemployment. SO you DID get a new camera?? I did Dopp. Can’t live without one!! There is no more need in justifying the purchase of a camera as there would be for justifying the purchase of food. Your life is not complete without either. You’ll get used to all the new functions and buttons. There is plenty of online info to peruse. Enjoy! The “…For Dummies” site is very helpful!Thanks! Thanks Eric. She is a funny little being who makes me laugh every day! There’s nothing quite like the fun that comes with a new camera. Have plenty! Thank you! I’m learning and having fun with all the possibilities! Thanks coachtsite. So nice of you to stop by and comment. She needs a bath, Cheryl. It’s been too cold to do outside and since she hates the very idea, unless it is a lovely cooling experience, I’m not going to tackle it! My phone long ago replaced my camera because the photos are so much better. I’m also terrible at all the settings and the phone more or less does it all for me. Your shot of Alice made me smile. I love the expression on her face, as if she’s wondering what you’re up to. Thank you Marie. If my phone had a better camera, I would probably use it. It is one of the original iPhone’s and just doesn’t have much to offer… On the other hand, I am very impressed with what you can do with your phone/camera. Your shots are always crisp and clear!